With a spill-proof bite valve and a shape that fits most cup holders, CamelBak's Eddy water bottle is perfect for travel and pops right into the dishwasher for easy cleaning. 2. Once logged in, click the "Get Offer" button and you'll be directed to the Sierra website to make your purchase. Note: If you're on mobile, scroll down and click on "View Desktop Site" to see the cashback button. 3. Add one (1) CamelBak Eddy Water Bottle - BPA-Free, 20 fl.oz. priced for $6.99 to your cart and shop as you would normally then checkout. If the price changes or anything happens to the stock, the deal is officially over. 5. 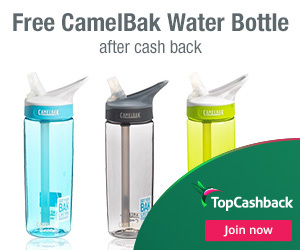 In about 14 days $12.94 cashback will post in your TopCashback account. Offer valid through May 9, 2019.